It's 3pm and your stomache is gurgling... wait wrong topic. 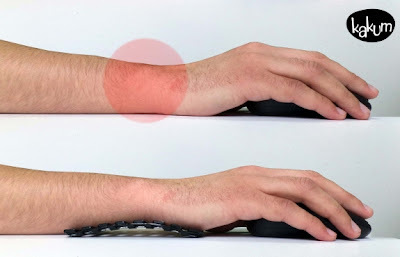 It's 3pm and you've been staring at your computer screen all day, hand affixed to your mouse. You click and suddenly, there's that cramp in your wrist. It screams at you: "You MONSTER! Haven't I done enough today?!" And you ignore the voice in your head shooting pain in your arm to click again. Regardless, I found a smart, simple office accessory that I could really use in those particular moments. Kakum is a a small, lightweight support for your wrist. Like a gel support on a mousepad (remember those?) Kakum is flexible and responsive to your wrist movements. But unlike those gel supports, it moves with you. You adjust it to fit, then rest your wrist on it and grasp your mouse. The shape and flexibility reduce the number of pressure points between your arm and your desk, and reduce strain. And it looks like an exoskeleton, which is just the next step in the design, right?! Next we'll just clip these things onto our arms and eventually, we'll just replace our bones with carbon fibre and... hmm, maybe I need to lay off the sci-fi movies for a while. FYI: Join me Friday, April 12th at the Ottawa Public Library Main Branch Auditorium for a FREE lunchtime session: "Hacking is a mindset, not a skillset." For more info and to RSVP, check out the event details.